I have been working on paintings with limited palettes, for several shows I am entering. I am finding this is a wonderful way to learn values and temperatures better, and it is resulting in some very interesting paintings. This one is "Just Blues". It's a photo from the Celery Fields in Sarasota FL, where I was painting en plein air several months ago. This is on the path that winds up and around the tallest hill in Sarasota County! 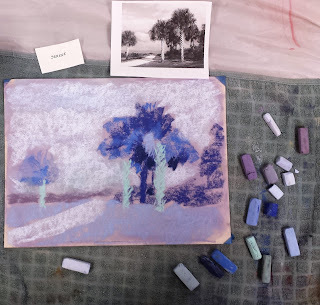 This blog is a step-by-step creation of a pastel painting done all in blues, beginning with an alcohol wash, to tone the surface. I started with white Wallis Museum paper, mounted on foam core. 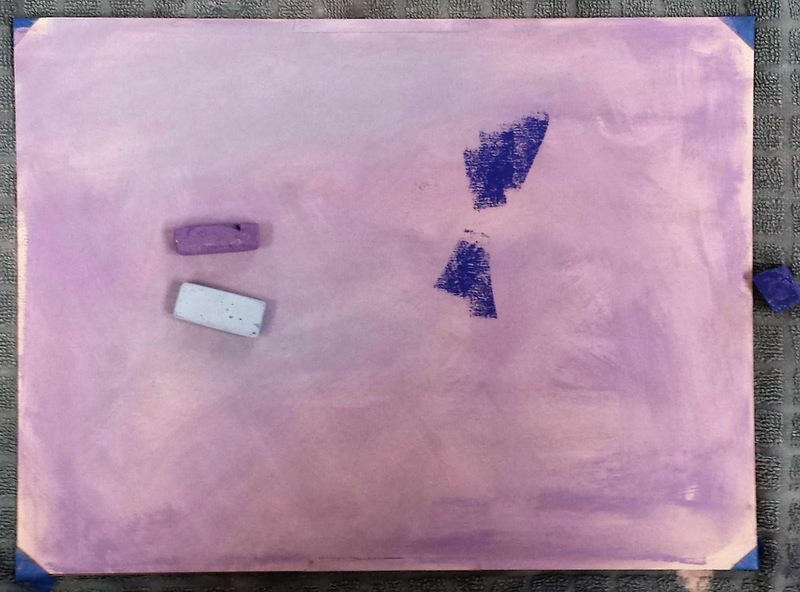 After lightly stroking my chosen violet pastel on the surface, I brushed it evenly with denatured alcohol. Step 2. Here you can see that I have lightly covered most of the surface with some of the colors to the right, to establish my value and shape design. 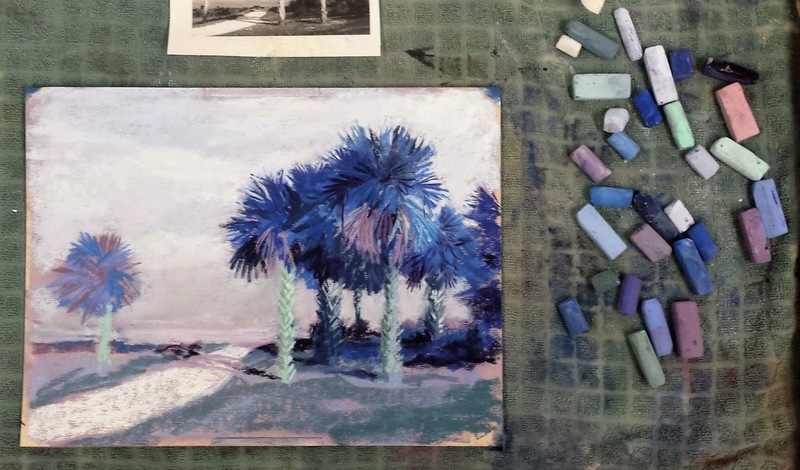 You can see my reference photo, which I printed in grey scale, so I could concentrate on the values, rather than local color, since this is to be all blues. Step 3. I begin adding some other colors, including a blue green, as an undercolor for the grass. 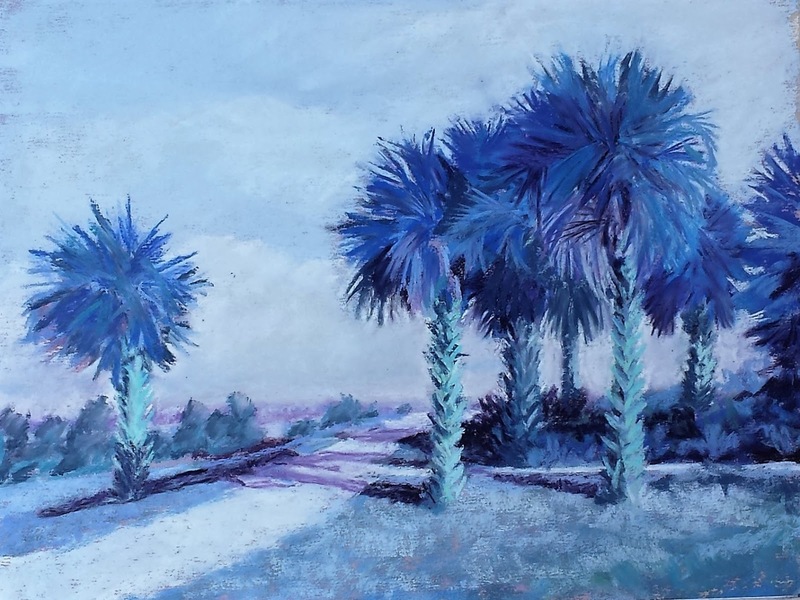 Just because I am limiting this painting to blues does not mean I cannot have other hues beneath those blues, to enhance the effect. 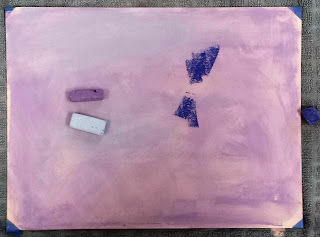 You can see various blues, violets and turquoise sticks next to my painting. I work with a towel under the work, so I can wipe each stick clean before making a mark. Further development of lights and darks, including the sky. Step 5 to the finish. I take a day to evaluate where I need to add, subtract or change color, value, temperature, even compositional elements like shadows. 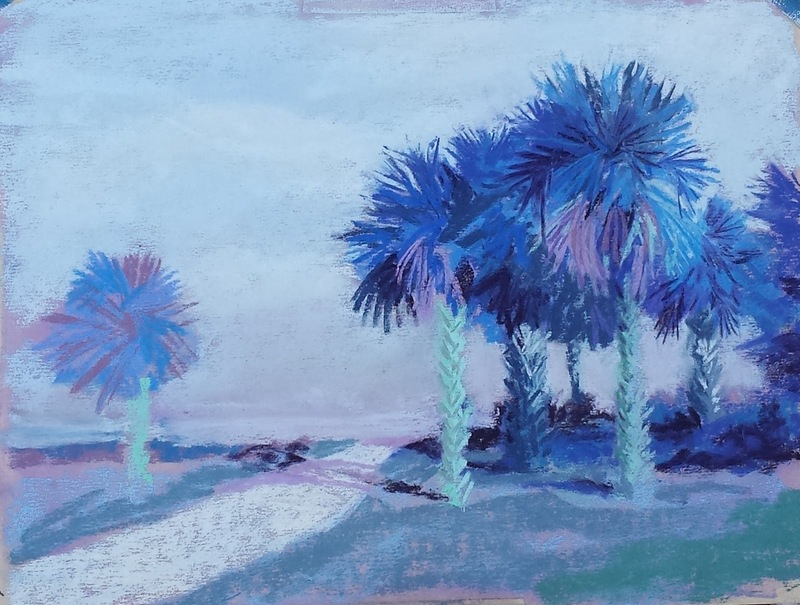 Here I have mostly worked on the tree trunks and fronds.I can see the shadows on the path, the field to the left of the lone palm, etc, all need work, as well as the grassy area in front. I also notice I forgot the side path, going behind the two front palms, along the hill leading right from the main path. Fantastic palette! 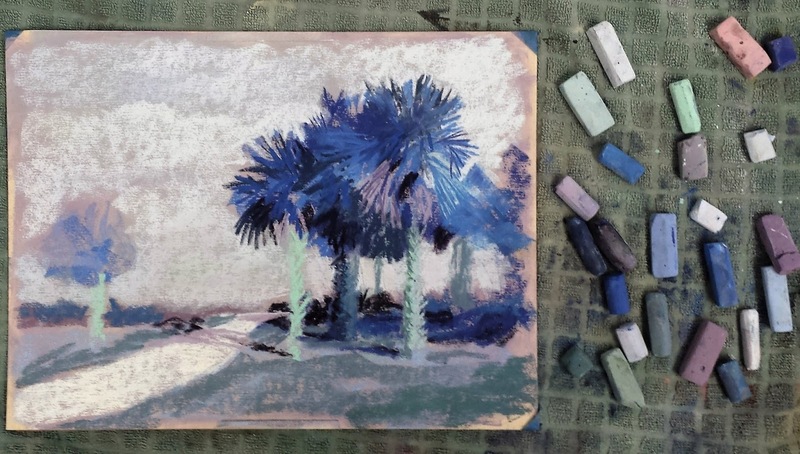 Limited palettes are so fun.